Methodology Validation and Structure Correction by Total Synthesis: the Case of the Clerodane Diterpenoid, Sacacarin (R.B. Grossman, R.M. Rasne). Total Synthesis of (±)-Cylindrospermopsin (B.B. Snider, Chaoyu Xie). The Total Synthesis of (-)-Arisugacin A (R. Hsung, K.P. Cole). Total Synthesis of Kainoids by Dearomatizing Anionic Cyclization (J. Clayden). Total Synthesis of Jatrophatrione, an Unprecedented [5.9.5] Tricyclic Antileukemic Diterpene (L. Paquette). Alkynyliodonium Salts in Organic Synthesis (K.S. Feldman). How to Thread a String Through the Eye of a Molecular Needle: Template Synthesis of Interlocked Molecules (M. Kogej et al.). Total Synthesis of Spongistatin 1 (Altohyrtin A): a Tale of Ten Aldols (I. Paterson, M.J. Coster). The Ring-Closing Metathesis Approach to Fumagillol (J. Eustache, Pierre Van de Weghe). Devising an Especially Efficient Route to the 'Miracle' Nutrient Coenzyme Q10 (B.H. Lipshutz). Total Synthesis of Lipid I and Lipid II: Late Stage Intermediates Utilized in Bacterial Cell Wall Biosynthesis (M.S. VanNieuwenhze). Ring Rearrangement Metathesis (RRM) - A New Concept in Piperidine and Pyrrolidine Synthesis (Sandeep Basra, S. Blechert). Catalytic Asymmetric Total Synthesis of (-) -Strychnine and Fostriecin (Masakatsu Shibasaki et al.). The Synthesis of (±)-Strychnine via a Cobalt Mediated [2 + 2 + 2] Cycloaddition (P.C. Vollhardt, M.J. Eichberg). 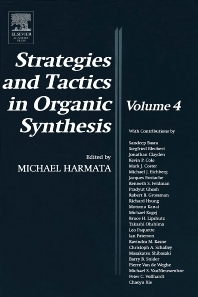 A classic in the area of organic synthesis, Strategies and Tactics in Organic Synthesis provides a forum for investigators to discuss their approach to the science and art of organic synthesis. Rather than a simple presentation of data or a second-hand analysis, we are given stories that vividly demonstrate the power of the human endeavour known as organic synthesis and the creativity and tenacity of its practitioners. First hand accounts of each project tell of the excitement of conception, the frustration of failure and the joy experienced when either rational thought and/or good fortune give rise to successful completion of a project. In this book we learn how synthesis is really done and are educated, challenged and inspired by these stories, which portray the idea that triumphs do not come without challenges. We also learn that we can meet challenges to further advance the science and art of organic synthesis, driving it forward to meet the demands of society, in discovering new reactions, creating new designs and building molecules with atom and step economies that provide solutions through function to create a better world. Personal accounts of research in organic chemistry. Written by internationally renowned scientists. Details state of the art organic synthesis. Organic chemists; libraries at all colleges and universities and chemical and pharmaceutical companies.